Venaya Yazzie was born and raised in the San Juan Valley in northwestern New Mexico; she is of Diné (Navajo) and Hopi affiliations and is a member of the Eastern Navajo Nation. 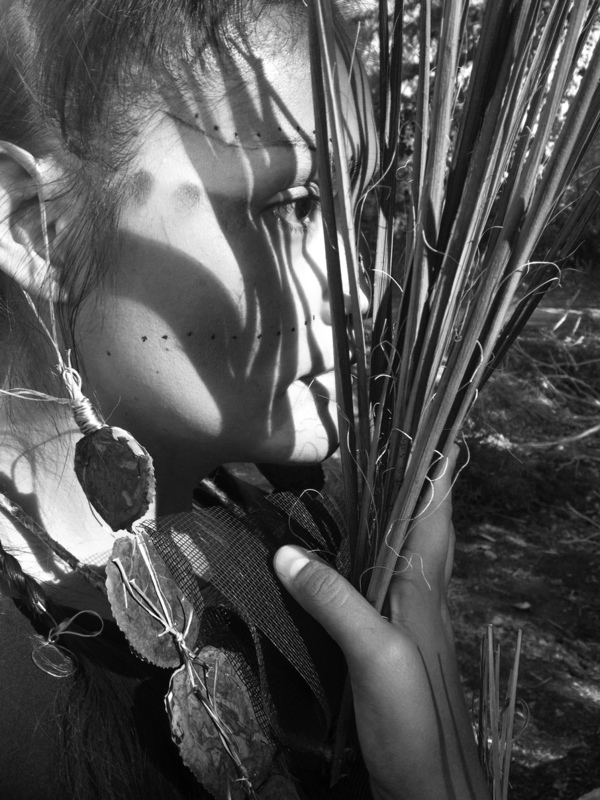 Venaya is a visual artist and educator who strives to reclaim the Indigenous stories of her desert people via her art, poetry and photography. 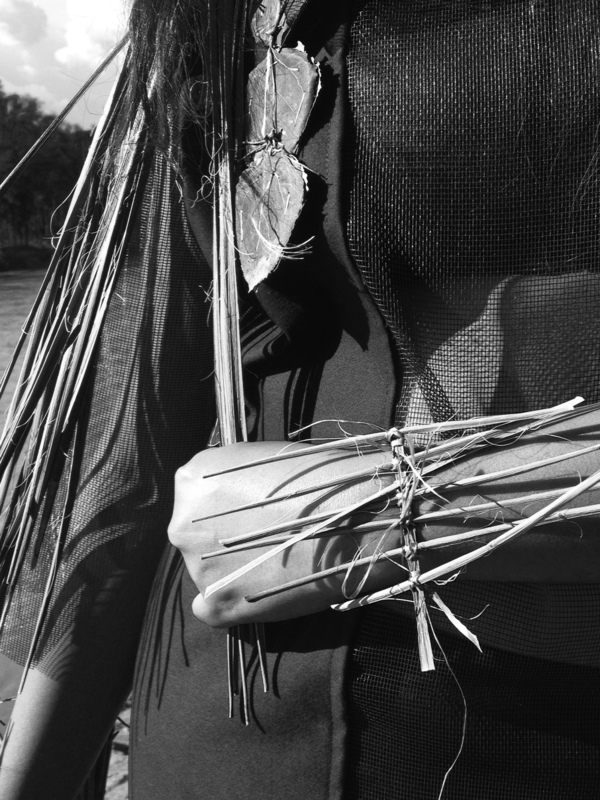 She has worked to document the oral histories of the Navajo elders of Eastern Navajo in the community of Huerfano, NM. Yazzie graduated from the University of New Mexico with an MA in Education and minor in Indian Education; she is also an alumnus of Fort Lewis College, in Durango, Colorado and the Institute of American Indian and Alaska Native Arts in Santa Fe, New Mexico. She is a member of the Northwest New Mexico Arts Council and has been an Artist-In-Residence of the Bisti Writing Project. In Diné (Navajo) epistemology the children are traditionally taught that when we are first conceived in the organic world of our desert matriarchs, we are water. In the trade of stories of contemporary Diné, we understand how we grew in the circle of the womb and were molded into human form, we conceive that we are water. When we leave our matriarch’s womb, we are water. When we take our first breath, we are water. As modern desert dwellers, as Diné we express, ‘tó éí iíná.’ Water is life. On August 4, 2015, the Environmental Protection Agency (EPA) “accidentally” released heavy-metal laden contaminated water from the abandoned Gold King Mine into the flow of the Animas River in southwestern Colorado. The warning to the people and communities down river was not given until the next day. In southwestern Colorado, later to the state of New Mexico a formal acknowledgement of the river contamination was finally admitted four days later by the EPA when the federal entity began a series of public meetings throughout the communities affected. As an Indigenous citizen of the area and a member of the Eastern Navajo Nation in New Mexico, I watched in distress because the Animas River and San Juan rivers play an extremely pivotal role in contemporary Diné people’s lives. At the two rivers, the Diné have 'converged' for prayer, ceremony and celebration for time immemorial – the waters of these two rivers is embedded in the DNA code of the Indigenous people of this community. I am a desert ancestor of the waters that flow through a beautiful desert valley on the northwestern area of the Diné lands, or as you may know it, the Navajo Nation. It was instilled in me that my Indigenous matrilineal clans are derived from the sacred element of water. I was raised in the San Juan Valley in northwestern New Mexico, my family history includes stories about the Animas and San Juan rivers that have come to be named by those who colonized the area as such, but many histories before they arrived to the area, the river community was called Tó by the Diné. The river was named a 'sacred' place or site, and to this day the river is a place of spiritual power, but it is only known to those who understand and recognize it for the true purpose of it. Respect for desert water is the Beautyway. The toxic pollution of the Animas and San Juan waters is murder of monumental proportions, for the effects of the contamination have staggered the cultural ways of my Diné community. I think that we each mourn the loss of our relative, we do this in our own way, but for many of us we just cry, and pray. It is an act that humbles us as humans, but it is also a recognition of our Creator God that we must have faith and continue to worship and praise for what we have been given. At this time, many Diné are suffering the loss of their crops, including sacred corn and squash. The devastating effects of tainted toxic river water continue to hurt many people in the communities of Durango, Aztec, Farmington, Upper Fruitland, Kirtland, Shiprock and beyond across the Utah areas of the San Juan River, and on to the Colorado River and Pacific ocean. The people whose business is about utilizing the Animas River water continue to take a deep loss in revenue and livelihood. At this time many are comforting each other, uniting and helping each other to confront the issues of the loss of water in their lives. As Diné we will struggle, but we will always survive and endure because no one can take away our beliefs, our contemporary ways of being or our prayers, for many of us understand that we will always be water. 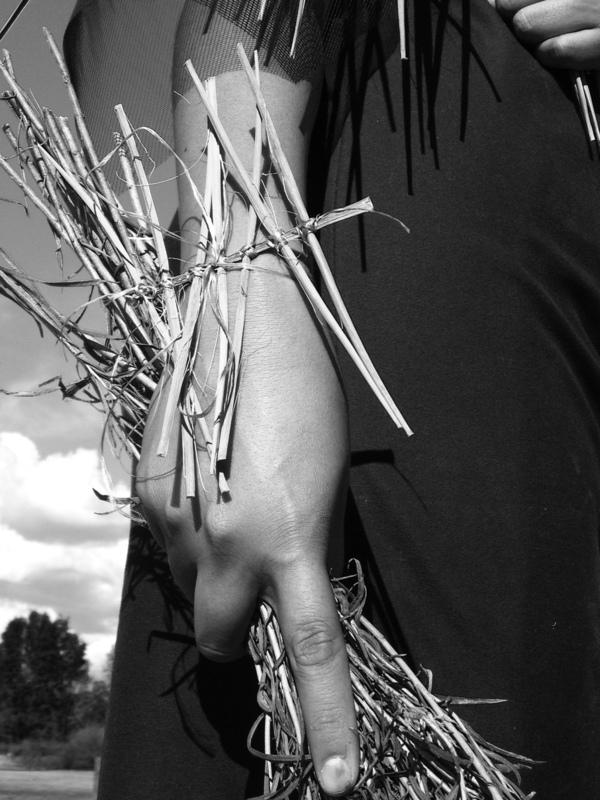 This female entity is created via my photographs to symbolize the endurance of the Indigenous, but further the modern Navajo people, and their defiance to survive and to continue life in hózhó. When you talk about Navajo epistemology, water is the beginning, it is everything. Without water the ritual, the ceremony is incomplete, therefore 'unbalanced' and 'hozho' cannot be perpetuated and the People are incomplete. These photographs were taken on location along the San Juan River on the Navajo reservation in northwestern New Mexico with my Navajo friend Crystal, who was also raised in the area. To ask her to be a part of this critical photograph series is perpetuation of sacrifice for the People, it is what we do as women of a matriarchal society. I created and produced the clothing she is wearing including the adornment items. Woman of Water: Baa’ is meant to instill the teachings, but also to inspire and empower the Diné women of the 21st century to continue the legacy of the matriarch warrior who is needed to ensure the survival of the People.